Speak to Alex and the other Soul Riders outside the stable at Silverglade Winery. I’ve spoken to the druids and they have a new set of directives for us. Ready to get stuck in again? Alex will explain her plan to continue to watch Dark Core. What we need to do is be vigilant: watch and wait. Of course we’re missing our friend Anne, but Fripp and the druids are currently working out a safe way of traveling to Pandoria to look for her. Until then, there’s nothing we can do for her. It feels terrible to just sit and wait. It’s unbearable to know that our friend is there and we’re here doing nothing. I know how horrendous it is there. Believe me when I say that every second you’re there feels like a nightmare a hundred times worse than death. I know, Lisa. I know. But it’s just like Alex and the druids say. We can’t do anything now. They must be able to! But if it takes too long…? …Then we take matters into our own hands. Agreed. Anyway, now it’s time to plan and prepare while the enemy forges their dark plans. When they strike, we need to be prepared. Strike faster, strike harder. We want to know if Dark Core and the Dark Riders are up to something awfully suspect. The very worst thing that could happen would be if they started the Dark Ceremony to open the cracks between Pandoria’s unreality and our reality. That would mean that the flow between the two worlds would run completely out of control and both worlds would collapse. We’ve got no idea when or where they’re going to strike. We’re not ever sure exactly how either, but Fripp and the druids are trying to work it all out. If we get more information from the druids, we might have some new tasks to complete, but until then, we need to stay vigilant, keep watching and waiting. Raise the alarm and take action if something unexpected occurs. I did a little surveillance last night and found a number of suitable locations for observation. I’ve informed the Spymaster of the newly developing situation. He and his agents, the chipmunks, and whatever else he’s got working for him are all on high alert and will let us know if they notice anything of interest. Linda, I thought you could perhaps be our liaison and base yourself out of the library where you provide the druids with your analysis of the scriptures. We’ll report to you Linda, and the best place for you right now is studying those texts and helping the druids to interpret them. I’ll keep my head in the books and be ready to receive your reports as well as keeping an eye on your observation schedules. You’ll always know where I am. See you in the Winery’s library whenever you need me. Me, Rita, and you Alex… We’re out in the field, right? Good. Then it looks like we’re ready to get started. I’ve got the map right here with all the observation spots marked out. I think Observation Station #42 will be perfect for you Rita. It’s a great lookout spot towards the sea, and you can get a closer look at Dark Core HQ. Aha. You don’t have any binoculars? You’ll definitely need a pair if you’re going to be able to keep watch properly. You can borrow mine if you like? I’ve got plenty in stocky, haha. Objectives: Do you need some binoculars? Tell Alex, you are in fact, needing binoculars. Here, you can borrow these for as long as you need them. You can use them more than once. You can see on the map where you should be going. It’s a nice place at the southwestern corner of Paddock Island. You know, south of Jarlaheim in the Harvest Counties. Objectives: Ride out to Observation Station #42 and take a look through the binoculars. The observation spot is located near a bush behind the upper paddock on Paddock Island, facing towards the ocean. Use the binoculars and take a peek at what’s going on at Dark Core. Uneventful day… I’ll come back tomorrow. Sounds like somebody’s screaming for help…? Return to Observation Station tomorrow. In the meantime, let’s go down the hill and see who needs help. Help! Oh gosh, there you are Rita! My friend! Objectives: Ask Sonja what happened. What are you doing down here crying, silly girl? How lovely to see you! Ow, ow, ow! I’ve got such a headache! Well, it aches all over actually! Sniffle. 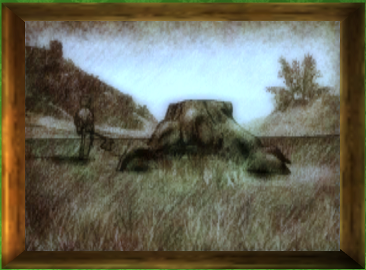 I was out on a long ride with my horse around all the beautiful countryside and galloped past one of the runestones… You know, the ones that are all over the place around here. This particular runestone just suddenly making weird noises and lighting up pink… My poor horse went crazy and just ran away! I wasn’t ready for it and ended up landing on my head. That’s what you get for not wearing a helmeeeeeet! Where my horse and my helmet are? Where my horse is right now, I’ve got no idea. I guess I was just too lazy to put my helmet on before I came out. I learned my lesson now though… I’ll never ride without a helmet again. Now I’m feeling really dizzy and everything hurts! That one. That one over there. By the seashore. The one that looks exactly like the other stupid runestones. Take a look at it, why don’t you? Be sure to come back and help me afterwards though, if that’s okay? Objectives: Examine the runestone then return to Sonja. The runestone is glowing with energy and runes circling in the air around it. What could this mean…? I agree with you, that runestone is definitely… Strange. And it’s ugly. Stupid ugly runestone. Please could you do me a huge favor and take me to the clinic in Jarlaheim? I don’t think I could get there on my own. Sniffle. I don’t think I’m very seriously injured but you never know, better to get the vet to take a look at me and see if I should head to the hospital. Could you take me on the back of your horse to the veterinarian in Jarlaheim? Objectives: Take Sonja to the vet in Jarlaheim for a check-up. Ugh, it hurts me just watching you ride, you pitiful girl, what is that?! Hello there! What’s happened here? Hmph. You see, kids these days! Thanks for taking me to the vet, Rita. You’re a true friend. That whole runestone thing was really bizarre. What did you say you were doing now? You’re going to meet Linda and tell her your findings? Say hey to her from me! Thanks so much again for your help. Objectives: Report to Linda in the library at the Winery. Return to the library and tell Linda everything that’s happened. I reckon that’s something you should talk to Alex about. She usually tells us about how she goes out and “talks to the runestones” sometimes… Some kind of errand for the druids, apparently. Some kind of measurement she takes. She’ll probably know more about why the runestones have been behaving strangely. I’m not sure what it could all mean. You should tell Alex all about it. I’ve no idea where Alex is right now though. She’s not out in the field on errands. Not according to my notes, anyway. Objectives: Check with the people around the Winery and see were Alex is. The person you need is Tyra. You can talk to others and they will tell you either they haven’t seen Alex, or to ask if Tyra has seen her. You can skip talking to others and go directly to Tyra. Are you looking for Alex? Alex said something or other about family issues before she left. That nuisance James is her little brother, right? Must be some scrape he’s gotten into that she’ll have to fix up as usual! Typical James. If I were you, I’d go to Fort Pinta and talk to him. Objectives: Talk to James in Fort Pinta. Ride or transport to Fort Pinta and seek James for information about Alex. Alex is going to meet our mother at the mall in Jorvik City. She took the bus out there a little while ago. You’ll be sure to find her there in the cafe, I’m sure. It’s not so often we get to see mama these days, just so you know. She’s just difficult. Always wants to borrow money from me, and that’s just not happening. Objectives: Take the bus to Jorvik City Plaza and look for Alex there. Make sure you have your bus ticket with you. Once at the mall, you can find Alex at a table with her mother in the back of the cafe. Rita, this is my lovely old mother. Me and my mother are just gonna finish up here. We’re almost done, I’ll be right there. Objectives: Wait until Alex and her mother are done talking. What do you mean, wait? Don’t you mean eavesdrop… Since you pretty much stand there staring while they converse. Yes, mama! I’ve told you, you can stop thinking like that! I’m not only abandoned, I’m a bad mother as well. No, you know that’s not true. We love you mama! All of your children love you. Stop saying those things, we all know they’re not true. I’m such a terrible mother… I’ve failed you all. Now you really can stop this. You’re our beloved mother and you haven’t had it easy, we all know that. That dad more or less disappeared isn’t your fault, and it’s not our fault either. It was his choice. You had to take care of us single handedly, which was no small feat, we all know that now. Look at us now! If I must say so myself, you did a great job! It’s all thanks to you that we’re here! We love life and we love you. Without you, we’d never be what we are now, and we owe you everything. Of course! You’re our beloved mama, and you mean the world to us so stop blaming yourself for things you had no control over that never really had such a bad effect on us anyway. You made our upbringing something special. Without you, the Cloudmill family would just be dust in a storm. We have a lot to thank you for. Listen mama, I’ve told you that you shouldn’t blame yourself… You’re the only person who thinks you’ve done something awful. Don’t take our happy childhood memories away from us now by saying such terrible things. It’s only you who suffers from carrying all this terrible weight, and none of it is even true, so it’s wrong! So stop this. Now. Just take a look at all the good things instead. Come on, shake it off! Just show me a smile and I’ll come and celebrate Christmas with you. There you go! I knew it! There was a little smile right there! Christmas is saved! Everything feels much better now. Thanks for waiting a while… Mothers, huh?! They can be so down on themselves. They never seem to understand that you just love your parents whatever they do. They only ever want the best for us, we know that. Even if it’s not always right every time. Ah well, I guess you didn’t come here to talk about mothers and families, right? Oooh, the runestones, yeah. I usually measure their activity, but I’ve not had time recently. I check the runestones so that I can calculate how active Pandoria is and whether there’s a strong flow between our reality and Pandoria’s unreality. This is crucial information for Fripp and the Keepers of Aideen. Hmm… You’re pretty advanced and you’ve come a long way with the Lightning Circle. Maybe you could help me take the readings from the runestones? Talk to Elizabeth about it, just to make sure she’s okay with it. You’ll really be needing your own rune wand by now as well. Get permission from Elizabeth and fix up a rune wand and I’ll meet you tomorrow by that runestone there. Objectives: Talk to Elizabeth in Valedale. Leave the mall and find your way to Valedale to speak to Elizabeth outside her house. I see that you’re traveling in the light of Aideen, Rita. Welcome back to my humble little village. What’s on your mind this time, my friend? I can assure you that you have full permission from the Keepers of Aideen to support Alex and the others in their collection of runestone readings. Come to think of it, we should have done this before now! Rune wands are incredibly rare artifacts. You’ve been able to loan mine before now, but I can’t give it away. It’s time for you to have your own, but I think this is the kind of thing only Fripp can help you with. I know he’s incredibly busy right now with working out what we’re going to do next, as well as working out a safe way in and out of Pandoria. He’ll have to find a little time to help you though. Objectives: Ride to Fripp in the secret stone ring by riding in a spiral by the runestones above Elizabeth’s house. Meet Fripp in the Secret Stonering. Greetings Rita! Time is against us. The time before us was long and the time we have left is minimal. Don’t despair though! It’s right now in the moment that everything happens! You’re here now, are you not? And who really are you? Really? Who are you? And what IS reality? Here and now? What is it? My winding and weaving star alignments are spinning and splicing a pattern that I soon will be unable to deny… Do you know who you are…? No. Who could even answer such a question anyway…? Fripp must weave and knit and stitch more patterns together… Sew and braid and think and fold and count and think and think and Fripp, Fripp, Fripp! Objectives: Convince Fripp you need a rune wand. Now. Okay. If you say so. I suppose it’ll be quicker for me to just give you a wand rather than spend time telling you all the reasons why you shouldn’t have one. I’ve seen in my timelines that you’ll have one later anyway. Later, in that which we most often call the future. I’m going to open a very tiny fracture right now between Pandoria’s unreality and our reality. That’s where your rune wand should materialize. When you see it, hurry and grab it before the fracture needs to be closed again. Ready? Objectives: Keep an eye on what’s happening. Be prepared to take the rune wand. Watch as a rift is opened and a rune wand rises out of it. Ride forward and click to take the wand. Once you have it, speak to Fripp and he will close the rift. So there we are, Rita. Your very own rune wand. Take care of it now. Off you go to the runestone where you’re supposed to meet Alex and learn about how to measure Pandoric activity. Or was it tomorrow you were supposed to meet her? Tomorrow… Yesterday, it’s all the same. You can now leave the Secret Stonering and return to your business for the day. Meet Alex by the glowing runestone on Paddock Island tomorrow. Dismount your horse to speak to Godfrey, so that you can set off to the museum. Right then ladies! Let’s get going! To the museum in Jorvik City, here we go! No ice cream in the car though… They seats are clean and they’ll be staying that way. Objectives: Borrow the harp of Aideen from the Museum Curator and return to Silverglade. You will be transported to the museum lobby. Move forward with Lisa and Linda to speak to the Curator, who is standing at the entrance. Good day to you! Welcome, welcome! I’m terribly proud to welcome you to Jorvik City Museum. Sadly, we’re closed right now because of all the refurbishment work we’re doing, but my good friend the Council Man has put in something of a good word for you young ladies. The Council Man’s friends are my friends! Since you’re my friends now, I shall of course open up the Museum for you! I understand you seek to loan something from our collection, hmm? Yes, dear Curator. We pray humbly to borrow Aideen’s harp. Our intentions are good, Curator. If we hadn’t been absolutely desperate, we would never had the cheek to ask! This is really important to us, and I swear by Aideen’s Light that we’ll bring it back to you in perfect condition. Well, well, I do suppose I promised the Council Man I’d help out. His friends are, as I said, my friends. If you promise to guard it with your life and return it no later than tomorrow, then I rather suppose it would be acceptable for you to borrow it. Did you know by the way that we’ve never been able to date the harp? We only know it’s incredibly old. Unfortunately all of our exhibits are in storage because of the renovation, so you’ll have to help me find it if you don’t mind… Rather silly of me, but I don’t actually have the inventory we made when we packed it all away, so it’s rather chaotic here. I know it’s in one of those boxes in the corner. You seem to be sharp and quick little youngsters, so you’ll be sure to find it amongst these things in no time at all. While you’re at it, you could even jot down a quick new inventory for me so that I know what’s in each box. That way, you can lend a hand since I’m lending you the harp! Of course, Curator, of course. Click on each box shown on the screen to open it and discover its contents. Continue opening boxes until you have found the harp. Click on it to pick it up. How wonderful that you found Aideen’s Harp! Do excuse the disarray here, but now I’ve got help getting started with the new inventory! That was handy. Follow Lisa and Linda to the door to return to the Winery. Finally home again! That went well. Maybe I could be convinced to drive you into the city again some other time. But only maybe. So, we’ve got the harp, but not the melody. I remember how to learn it though, since Elizabeth told me exactly how. We Soul Riders should have enough of the right spirit to make this work, says Elizabeth. One of the better places to hear the beautiful, mystic melody of Aideen is to embrace the dawn winds on top of the West Wall Cliff, but it’s hard to get to. Rita, y’know the path up to the Mountaineering Hut north of Firgrove? Meet me on the path up the Firgrove Mountain Passage, north of Firgrove, just north of where the Firgrove Championship starts, so we ride to the cliffs together before dawn. Objectives: Meet Lisa by the mountain trail just north of Firgrove. Follow her to the West Wall Cliff. Ride or transport to Firgrove and meet Lisa on the trail outside of the village. If you do not know the location, it is highlighted on your minimap. Hey Rita! You’re here already! We’re a little early, but we can go to the place they call the West Wall Cliff, and wait for daybreak there. Seriously though, Rita, I don’t think this is gonna work. Riding on the water… We’ll see. I hope it works out though. I really hope with all my heart that we can do this and repay what we owe to the Primeval Tree. It’s misty up on the mountain top and there’s wolves up there. Ah, well. Come with me now and stay close. The path is steep and dangerous, and the location is hard to find. Follow Lisa up to the cliff. It was easy for me to follow her, but I got disconnected from the server after this quest and had to find my way back up there on my own and found that difficult. In case that happens, if you lose Lisa on the way there, or want to find it on your own, here is a video that shows the route she takes up to the cliff. Here it is! Wonderful views! Isn’t it beautiful? Lovely that the mist clears a little all the way up here. Then we’re only waiting for daybreak. We’ll sit here and eat some chocolates while we wait. Objectives: Listen to Aideen’s song in the dawn light. Await the coming of daybreak, and when the song appears to you, click to catch each glowing piece of the song. You may have to move your horse around on the cliff and rotate your camera to easier catch each song piece. Her song was so beautiful! Now I’ve learned the melody, we’re all done here. Right then. Let’s rest a little here in this beautiful spot and practice the piece of music a little before we try to pull off this feat later. See you down by the beach when we feel ready… Next to where the roots stop. You’ve got the Fragment of Aideen’s Light, haven’t you? Don’t forget to bring it with you. Objectives: Take Aideen’s Light with you and meet Lisa by the beach, right by where the roots stopped. Be sure to have the Light fragment in your personal inventory. It cannot be deleted, so it is either in your backpack or your stable supply. When you are ready, meet Lisa on the beach in Forgotten Fields, where you previously found the place that the Sleeping Widow’s roots reach the farthest. The location is marked on your minimap. Hi! You excited? You’ve got the Light of Aideen with you?! Then let’s give this melody a go, shine the light from the fragment and then ride over the water to the beach just below Scarecrow Hill. Sounds simple, right? Right, we’ll ride over the water here if everything’s as it should be. Stay close to me and shine the Aideen Fragment at even intervals; the roots must be healed with an even and steady flow. Keep pace with me or you’ll end up in the water and we’ll have to start over! Objectives: Ride close to Lisa. Shine Aideen’s Fragment at regular, even intervals. Stay close enough to Lisa to remain on her magic circle of light above the water. At the same time, click the button to shine the light at regular intervals. It cannot be used too many times in a row, but also do not let the magic meter empty or you will have to start over. Don’t fall in the water either, or its back to the beginning. Reach the other side safely and speak to Lisa there. Woah. What have we done?! Seems like it actually worked! I’m speechless. I never thought it could happen… I think we’ve performed a miracle! It’s not every day we get to make a miracle happen… Now we should ride off to the Sleeping Widow and make sure everything is in order and that she feels we’ve paid our debt to her! See you by the Primeval Tree! Objectives: Talk to the Sleeping Widow and make sure she thinks you’re all even. The quickest way to get there is to ride to the Riding Hall and cross the water behind the Hall and into the Forgotten Fields. Whichever route you choose to take, meet Lisa by the Sleeping Widow. Creeeeakkk… Greetings my little kittens. You’ve done incredible deeds and have fully repaid your debt to me with the tasks I asked for. I now have re-established contact with my kinsmen and my life now has a new meaning. All thanks to you! Thank you my beauties. Go in peace. Fantastic. Now we’ve restored the balance! Hahaha, there I was thinking we’d never do it. Luckily I was wrong! There’s just one thing left to do and that’s to return the harp to the museum. Hmm? You want to do it? Fine by me, haha! See you later at the Vineyard. I’m going to see if I can find Alex, who should be on guard somewhere or other. I’m dying to tell her what we’ve been up to! Here’s the harp! Handle it with care. When you have it in your grasp, you can really get a feel for just how old it is. Hopefully our bitter butler is down with driving you into the city again. Objectives: Take Aideen’s Harp back to the museum. Ask if Godfrey, the butler, would be able to drive you there again. Return to the Winery and speak to Godfrey there. Ah, good day to you! Hhnnnggg… Back to the museum?! Again?! Hmm, well I rather thought as much since you’d probably need to be heading back with the harp. Well, if one has applied oneself to a task, it’s best that one sees it through to the very end, even if it is in the role of a private chauffeur. Well, you should let me clean the harp first. Perhaps it needs a little attention after having been used. It’s not often one gets the chance to handle such a beautiful artifact outside the museum walls, you know. See? There we are! Now the harp is beautifully clean and looks in lovely condition. Now let’s head to the museum! Here, hold onto the harp the whole way there so that nothing happens to it. To the museum! Objectives: Give the harp back to the Curator at Jorvik City Museum. Approach the Curator to speak to him and show him you returned with the harp. Ah, look! Look who it is! Welcome back to Jorvik City Museum! And, ah, look! The harp is with you and it looks just like how it did when you loaned it, not that I would expect anything else of course! I truly hope you got good use from the beautiful old thing. Set it down carefully in this box, if you would. You’re the Council Man’s friends, and his friends are of course my friends, and friends are always welcome at the Museum, regardless of whether it’s open or closed like it is now for refurbishment! Leave the harp back carefully in that empty box beside me and then we’re all done! Click to place the harp into the open box beside the Curator, then head towards the door to return to the Winery. Speak to Godfrey when you arrive. So, you’d say we were finished to-ing and fro-ing to the museum? Splendid. Thank you Rita for all the help! I’ve told Alex what we’ve accomplished today. Thanks to you Rita and Linda, we managed to get that weird request from the Primeval Tree all fixed up! Without you guys, I’d have been full of doubt. I wouldn’t have been able to do what we did on my own. It’s such a relief to have you around, and it’s even nicer to no longer be indebted to the Primeval Tree. You’re all such true friends! It’s an amazing feeling to be back with you all. It was fun working with you all, too! The adventure is over. For now… We’ll see what happens here next; it doesn’t seem as though Alex, Linda, the druids, or scoutmasters have spotted any increased activity from Dark Core yet. We’ll have to stay on the lookout! It is time to pay our debts to the Sleeping Widow for rescuing Lisa. Speak to Lisa and Starshine at Jorvik Stables, near the stables’ inn. Hi Rita! Now I feel truly rested after our recent hardships. I’m ready to talk with the Sleeping Widow to be able to repay the debt I have to her after she helped me out of Pandoria. Perhaps you can help me with that? You know that ancient tree better than I do at this point, and I have the feeling that I won’t exactly get away with being given an easy task. How lovely that you want to help me. I’m afraid I’m going to need all the help I can get. Let’s find out what kind of pay-off the Sleeping Widow is expecting. Last One to the Tree’s a Little Piggy! Right then. Ready for a little adventure? Nice! Let’s see who’s gonna get to the Sleeping Widow first! Last one to the Primeval Tree is a little piggy! Take whatever route you like! Hmm… I’m thinking I’ll probably go through Goldspur Farm and over the north of Grey Dew Mountain. Starshine! Run like the wind! Woohoooo!! Objectives: Ride together with Lisa to the Sleeping Widow. This quest is a race with a time to get to the Sleeping Widow, though you get seven minutes to complete, so it is ample enough time to take whichever route you choose. Lisa will run ahead of you quickly and you will lose her at about the Jarlaheim gates, no matter the speed of your own horse. Continue your trek to the Sleeping Widow and the race will end when you get there. Hahaha! That was fun! You did it! You won! So I guess that means it’s me who’s the little piggy, hahaha! But little pigs are cute too, right?! Is she really still awake? C’mon and we’ll head home. It’s probably for the best. Hmm? You want to try getting through to her? I suppose that’s a good idea. Objectives: Is the Primeval Tree asleep? Click on the tree to try waking her again. Objectives: Listen to the request of the Primeval Tree. Oh! You’re awake after all. Creeeeaaakkkk… My dear friend. I’m as awake as I can be. Firstly, I just want to repeat my thanks for helping me out of Pandoria’s prison. Without your help and the help of Starshine and Rita, I’d never have been able to leave. I’m here to repay my debt to you. I’m completely at your service. What could I possibly do to repay that which you did for me? I helped you out of your prison. Now I want you to help me out of mine. My wish is that you help me once again become a part of the contact network of the Primeval Trees and I’m certain you can help me. Creeeeakkk… Humans took the lives of my kin with their barbaric deforestation. Such despicable treatment! I will never forgive them, even though they realized it was a hideous mistake. Traitors. Deceitful in soul and nature. Well, well… Creeeeakk. As if it wasn’t enough that I was left alone when the lives of my kin were torn down, I was also disconnected from our network. Because of all this death, the roots that connected me to my kin withered away and died, leaving me isolated from our community. Creeeeakk… I haven’t been in touch with my kind in centuries. I thought perhaps you might help in taking care of that, Lisa and Rita. Dearest ancient tree! It’s a true honor to receive such a task. Do you have any, umm… Some kind of, err, suggestion as to how we might exactly go about it? Crreeeeakk… Ah, Lisa. I have a suggestion. When Aideen came to the world, she healed the land and spread life over the dead cliffs. With her song, her music, and her light, you can ride over the bay and bring my roots back to life so that I might reconnect with the Primeval Tree at Scarecrow Hill. Creaakk? Difficult? No, no, my little friends. Aideen did it and so can you. I don’t know how you’ll do it. Aideen could. You’ll simply have to figure out how she did it. Now it’s just a matter of a few roots; Aideen actually created life! I’m not asking for those kinds of miracles from you. How… No. It… It can’t be that difficult. My roots need to reach right across the bay. You can see the Primeval Tree on Scarecrow Hill from here. So close, yet so, so far away. When my roots reach the other side, I’ll be part of the network of Primeval Trees again. We’ll do our absolute best. We promise to do everything in our power to help you. Creeeaaakkk… I know you’re capable. Aideen was. It’s up to you to get this done. The time for talking is over. Hmm? Ride over water? Bring dead roots back to life? How’s that going to work? This all sounds pretty tricky. I doubt it’ll work out. I’ve got no idea how we’ll follow through on her request. I suppose we can at least start with a little reconnaissance. Let’s get going and see if we can locate the remains of the sawn-down Primeval Tree. I seem to remember seeing a huge tree stump when I’ve been riding by the beach a little north of here… Let’s go and check it out! Objectives: Ride to the stump of the dead Primeval Tree and talk to Lisa. Follow Lisa to the stump of the dead tree. If you happen to lose sight of her, the location is marked on your minimap. So, here’s where the Primeval Tree used to stand proudly before it was sawn down centuries ago. Around here is roughly were the Sleeping Widow’s roots reach. We’re going to make sure the roots grow out over the bay here and right across the beach at Golden Hills Valley on the other side. See? Let’s ride down to the shore and take a closer look. Objectives: Ride to the shoreline a little to the north and talk to Lisa. Follow Lisa to the shore where the roots reach out. This location is also marked in case you lose sight of her. Ah, here’s a better view. See? Right down there, I can imagine how the roots would push outwards… They’re a few feet down below the water’s surface, but it’s here they reach and no farther. Hmm. How’s this ever going to work? Can’t we just pull some string across the bay and attach a couple of tin cans on either end? Easier to just talk on a tin can phone, right? Hahaha! Nah, sorry. Seriously though, it’s pretty obvious we need help. We need advice. Linda knows loads about the Primeval Tree, and Elizabeth is usually full of wisdom. Linda and Alex are most often to be found on spy duty along the coast. They’re keeping a lookout in case Dark Core’s hoods come ashore someplace. Sometimes they’re free though, and in those cases, Linda’s almost definitely at the Vineyard. I can ride over to Valedale and talk to Elizabeth if you go to the Vineyard and get Linda’s advice? Objectives: Ride to the Vineyard and see if you can get some advice from Linda. Ride or transport to the Silverglade Vineyard and find Linda near the stables. Hey Rita! So it’s you again! Nice to see you… Any news? Oh! You said you’re going to do what now? The Primeval Tree thinks you should copy the exploits of Aideen? From the legend? Objectives: Listen to Linda’s advice. When I read about the Primeval Trees and their fate, I also learned that the Sleeping Widow was cut off from the network of roots and so can’t communicate with the others. I really understand why she’d asked you to do this; it must be awful to be so isolated in that way. But bringing life to dead roots, or even getting her roots to grow across an entire bay? Sounds complex to me. That said, those Primeval Trees are wise. According to the legend, Aideen had a harp in one hand and the life-giving light of Jor’s Flame in the other when she rode across the water. The legend says that her music and her life is what brought forth life to Jorvik. Lisa possesses the strong healing power of the Star Circle. With Lisa’s healing magic, and if you’ve got the light and the harp… Maybe you can actually do something similar to that which Aideen did in the legend? Maybe you don’t literally need to actually ride over the water. Surely you can use a boat? Either way, you’ll need the harp and I know where it is. Oh! I have a text message on my cell from Lisa! It seems as though Aideen’s harp is on display at the museum at Jorvik City. They usually have it on show when they have their historical exhibitions. Hey, by the way, did you know that this is the actual harp that’s on Jorvik’s flag? 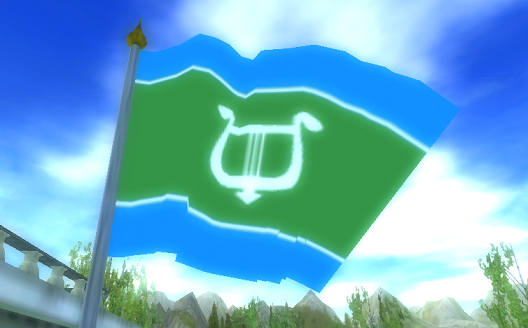 The green on the flag represents the beautiful green island of Jorvik and the luscious and rich life which covers the island. The blue above the green represents heaven, and the blue below is the sea. The white lines symbolize timelines from history and for the future. But enough about Jorvik’s flag, now. Hey guys! Got anything yet? I was just saying that however weird it might sound, you might just be able to mimic Aideen’s legendary life-bringing movements, just as the Primeval Tree seems to want. Rita has the fragment. You Lisa, have got the healing magic from the Star Circle. Elizabeth already told you that you can ride over the water with the help of a melody played on Aideen’s harp. If that works, you won’t even need to think about cheating with a boat! Amazing! It sounds totally crazy but it’s worth a try in any case. The worst that can happen is that we get a bit wet ’round the hooves! I’m super doubtful as to whether it’ll even work though. Ah well, I guess it’ll be me playing the harp then, since I’m pretty well used to string instruments. Rita, you’re alright with shining the light fragment? Y’know, since you’ve used it before and all? Aideen’s fragment which is with Rita is still loaded with light so it doesn’t need to be recharged. That’s good. But back to the harp. Sadly the museum in Jorvik City is closed for refurbishment. Yeah, typical. I heard that from Elizabeth, but she said the Councilman in Silverglade Village is friends with the museum curator… And you, Rita… You know the Councilman pretty well, right? Rita, you ride over to the Councilman and ask if he wouldn’t mind asking the curator for a favor by opening up the museum and lending us the harp for a while, okay? Then it sounds like we’ve got a plan, right?! Do You Know the Museum Curator? We’ll meet up again here after you’ve spoken to the Councilman in Silverglade Village. Objectives: Talk to the Council Man in Silverglade Village. Ride to Silverglade Village and find the Council Man near the Town Hall. Rita! Wonderful weather, no? Almost every day it’s this nice! Have you thought about that? Hmm? If I know the Museum Curator in Jorvik City? I know the Museum Curator very well indeed! We’re old classmates, him and I. I can guarantee he’ll let you in and let you borrow anything you need if I put in a good word for you. I’ll do that of course. Put in a good word, that is. You can put my good word in the bank! I’ll call him right after you leave. You can ride back to your friends and let them know that the curator will absolutely welcome you with open arms! Of that you can be certain! Objectives: Talk to Lisa and tell her that the Curator is on board. Return to the Winery and tell Lisa the news. Fantastic! Now we know that at least we’re welcome at the museum! The miserable old fossil doesn’t want to take us to Jorvik City! At least not without our parents’ permission. Stupidest thing I’ve ever heard… Godfrey and the Baroness owe us pretty big and I’m not sure they even realize that we’re not kids anymore. Can’t you try and convince him? Objectives: Convince Godfrey the butler to drive you to Jorvik City Museum. “Convince That Butler!”, the newest gameshow coming to Jorvik this fall! Speak to Godfrey to ask if he will drive you and your friends to Jorvik City. It’s rather strange how everybody suddenly wants to go to the big city. You’re a responsible lass with decent judgement, so I rather expect it would be quite fine for you to come along to Jorvik City. That said, it shan’t be happening before tomorrow, as it’s then that I have business to attend to in town. You shall have to remain patient until then, for a little order and regulation goes quite the distance, you see. Return to Linda in library at the Winery and see if she has found any useful information. Yawn… I’ve been looking all night and I think I’ve found an old note from the mid-18th century. Objectives: Listen to what Linda has to say about the Sleeping Widow. And so Linda recounts her findings. The legend of the Sleeping Widow goes back far in time. When the light of Aideen spread over Jorvik and life was brought to the island, a handful of Life Wardens were created, whose task it was to guard the growing life, to shield it, and to give warning if the flora and fauna of the island were ever threatened. These Life Wardens were brought into existence in the form of trees, who would forever live on Jorvik. The humans discovered these trees, respected them, and let them live. The humans understood the trees were special, ancient, and that they served a higher purpose. The humans came to call them Primeval Trees. The Primeval Trees had different looks and abilities and were much stronger and more magnificent in the olden days; their glory days. Today most of the trees slumber. They sleep. Tired and haggard. Lessened in power not least by the exploitation of Jorvik’s natural resources. It is said that the roots of the Primeval Trees penetrate all of Jorvik, and that the roots are linked together in an enormous network through which they can communicate. You want to hear a little more, right? It’s a fantastic story which I just have to share with you, and it’s important that you understand. You and I know of one of these Primeval Trees: the one on top of Scarecrow Hill. As the legend of the Golden Apple foretold, the witches have actually destroyed several Primeval Trees, but they only went for the trees that produce the golden apples, which the wicked witches shun. Other Primeval Trees were left alone. According to my writings, some kindhearted witches have actually made alliances with the Primeval Trees to help strengthen their magical powers. At least half a dozen Primeval Trees are known to exist today, mentioned in various records. There could be a lot more. In one place, one of the trees goes by the name of the Sleeping Widow. To understand this, we need to go far back in history, but I’ll be brief. Once upon a time, the Forgotten Fields was a dense, enormous forest. At least as magnificent as Greendale. The forest was protected by two Primeval Trees, which constituted a happy couple. 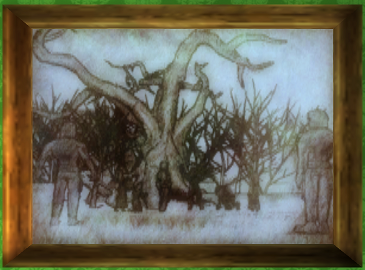 Everything was great, they were happy together and to the forest flourished – until the earl built Jarlaheim. When Jarlaheim was built, a great part of the forest was cut down, and the growing population in the area took down more of the forest to make both firewood and more building materials. A stable was also needed for the earl’s cavalry. Jorvik Stables was built, which later housed hundreds of horses. As more and more of the forest was destroyed, the landscape opened up and made room for necessary grazing grounds where all the earl’s horses could graze and run around during the day. In the blind eagerness of mankind, which often arises in their simple minds during times of great expanse, the foresters unfortunately cut down one of the two Primeval Trees in the area. It was a grievous mistake but the damage was already done, and it was irreversible. The surviving Primeval Tree became lonely, and it grieved over the loss of its life companion. She lost her will to live. Through her grief, and through mankind’s eager destruction and the grazing and stomping of the earl’s horses, the forest eventually died. During the centuries that have passed since the Primeval Tree became lonely, her wailing has sometimes been heard on the wind. A wail much like a persistent howl, which chases around with the gusts across the windswept hills. And so there stood one lonely Primeval Tree, and the Forgotten Fields. The area got its current name – the Forgotten Fields – after the earl’s cavalry and all the horses were no longer needed in Jorvik Stables. The lost forest and the grazing grounds were later forgotten, since the area no longer served any purpose for the humans. So much grief, for such a short chapter in history. They say that the wailing of the Primeval Tree can no longer be heard. It’s not because she has stopped grieving, but rather that she has fallen asleep of exhaustion, resignation, and sorrow. She’s on death’s door, if she isn’t dead already. But we hope she isn’t, of course. How everything is connected to Lisa’s current critical location in Pandoria I can’t quite figure out. But if she says the tree must be woken, I guess we’ll wake it. But how do you wake a magical, slumbering Primeval Tree? I think you should talk to Elizabeth directly. It seems obvious that this Primeval Tree, the Sleeping Widow, can’t just be woken up by a regular alarm clock. If anyone has any idea of what kind of magic would be required to awake a slumbering Primeval Tree, it must be Elizabeth. And Rita, I have a certain feeling you’ll get to use your fragment of Aideen’s Light. If you’re not already carrying it in your bag, you should stop by the supply in your stable and bring it with you to Elizabeth. That would save you a lot of time. Objectives: Ask Elizabeth’s advice. Bring your fragment of Aideen’s Light. You’ll find it in your bag or in the supply of your stable. The Aideen’s Light item is unable to be deleted, so if it is not in your inventory, you will find it in your closet in your home stable. You do not need it to complete this quest but you will need it for the following quests. Ride or transport to Valedale and speak to Elizabeth near her house. What a tale. What turn of events! We must indeed awake the Sleeping Widow to see if she can rescue Lisa. If Lisa says it is so, then it must be the way to rescue her from Pandoria. If it doesn’t work, we’ll try to find another way. Hmm… Maybe the roots of this Primeval Tree reach farther than we could ever expect. Anyway. I know of two things that can shake that ancient Primeval Tree enough to give it the energy it needs to wake up. The tree needs light, strength, and water. You must do three things. One. Fill a bottle of Aideen’s Tears. You know, the dew from Aideen’s flowers that grow around here. Two. Energize the fragment of Aideen’s Light by the rune stones up here, in the same way you did last time. You need to have the fragment with you. If you don’t have it in your bag, you’ll find it in the supply in your stable. You can’t have rid yourself of it, so it has to be somewhere, I promise you that. The third thing you need to do is to illuminate the tree with the energized fragment, and water it with Aideen’s Tears, and these two tasks needs to be performed at night. During the night the magic is undisturbed by the bustle of daytime, and the effect of Aideen’s power is so much stronger. Take the rune staff and ride up to the rune stones behind the house here, and energize your fragment of Aideen’s Light. This time, do it like this: First, use the rune staff on the rune stone of the sun, and then place the fragment onto the rune stone to energize the shard with the light of Aideen. If you can’t find the fragment in your bag, you’re guaranteed to have it in the supply of your home stable. You know, a white, shining stone… I know you can’t have lost it. Objectives: Use the rune staff on the rune stone of the sun, and energize the fragment with power by placing it on the rune stone. Again, you’ll need the fragment item to complete this quest. It cannot be deleted so it is either in your personal inventory or in your stable inventory. Go up the hill behind Elizabeth’s house to the open area with the rune stones. Dismount your horse and approach the one with the sun symbol on it. First use the rune staff that was placed in your inventory, to activate the stone. Then use the fragment on the stone to energize it. When you have energized the fragment, return to Elizabeth. Magnificent! The fragment has been energized with great power! Take this purple, tear-shaped bottle and gather up as much dew as you can find on the flowers of Aideen. You’ll need it to water the Primeval Tree, the Sleeping Widow. Objectives: Gather dew from the flowers of Aideen. Use the purple bottle on the flowers behind the Valedale stable. They are the same ones you collect from during the regular daily quest. When you have filled the bottle, return to Elizabeth. You filled the bottle! Good job. Here, take the full bottle with you. You’re ready to go to the Sleeping Widow. Wait for the night, then wake her. On your way, take the detour past Starshine and update him with the turn of events so he’ll know what’s going on and is ready to help Lisa out of the crack. Provided you succeed in waking the tree. Objectives: Take a detour by Starshine before you make your way to the Sleeping Widow. Ride out to Harvest Counties and find Starshine where you last left him by the Pandoric Rift. Rita! Neigh! How’s it going! I’ve almost lost touch with Lisa and this blasted crack is about to close on itself. Panic! So you found out who the Sleeping Widow is?! Do tell! So the Sleeping Widow is a Primeval Tree? Interesting. It’s not that far fetched an idea. Well done, Rita! Not to mention Linda, too! Now that’s hope that whatever is binding Lisa and the Sleeping Widow’s fate together also saves Lisa. We’ll have our answer tonight. Nee-ei-igh! I’ll stay behind, ready to help Lisa when you wake the Primeval Tree. I’m sure to be able to keep the crack open until midnight at least. Get on your way to the Primeval Tree on the Forgotten Fields, and wait until nightfall to perform the necessary rituals. Best of luck! May the light of Aideen be with you. Objectives: Ride to the Primeval Tree in the southeastern corner of the Forgotten Fields and await nightfall. The location of the tree is marked on your minimap. It is in a small valley behind a large plateau near the water. Approach the tree to complete the quest. You can only awake the Primeval Tree at midnight. Objective: Await the stroke of midnight to perform the awakening ritual. Await the falling night at the Primeval Tree. You and Summerblaze almost fell asleep by the tree. By sheer force of will you managed to stay awake. The Primeval Tree seems thirsty after centuries of grief… As if it hasn’t drunk from the life-giving water in a long time. Objectives: Water the Primeval Tree with the Tears of Aideen. Use the purple tear-shaped bottle on the Primeval Tree. Creak, crack… Water… So full of strength and life! The Primeval Tree seems pale after centuries of grief… As if it hasn’t embraced the light of the sun in a very long time. Objectives: Illuminate the tree with the Light of Aideen. Use the Fragment of Aideen’s Light on the tree. By the light of Aideen! Who are you? And what have you done with Aideen? Are you the one who awakens me? Are you the one who opens my eyes with the Light of Aideen, moistens my throat with her tears and makes my tree creak and crackle as in the days of my youth? Objectives: Tell the Primeval Tree you’ve awoken it to save Lisa. Crackle and creak. By the distant ghost of my roots! Who are you, who fights for the light in these dark times? Crackle… Let’s wait and watch… Let me think and creak and crackle for a little while… It’s been a long time since my branches murmured and my mind crept into action. Let’s creak and crackle here for a while. I promised Lisa, and promises are made to be kept, even those made to humans… Hmm. But why should I keep a promise to the people who betrayed me? But you are more than that. You’re not only humans. You’re the bringers of Aideen’s Light. I shall do what I can. Watch and learn. Objectives: See if the Primeval Tree is capable of helping Lisa. Watch to see what the Sleeping Widow does. Crack… Creak… Crackle… My force isn’t so strong. It’s far from what I’d hoped. Behold the result of my success. Or vanish forever through the work of my possible failure. I do not know how my attempt went. Objectives: Ride to Starshine and see if Lisa’s been rescued or not. But who’s this hiding over here…? Objectives: Someone is hiding in the bushes. Watch the scene that unfolds. HA! Now we got you and your wretched horse! Hahaha! This is what happens when you go about watering trees in the middle of the night. Hahaha! We got you now, Rita! We will make mincemeat of you and your horse and send you off to the blissful pastures of Pandoria’s eternal prison! Justin? Grab onto her. Now! You’re the one who’s holding the chains. Stop! Be gone, you spineless weasels! But… But… We have you imprisoned in Pandoria?! Not so confident now, are we? Your knees are shaking all over now that you’re not hiding in ambush. Cowardly lowlifes. You may outnumber us, but you don’t scare me. I’ll give you a taste of your own medicine! But… By the Light of Aideen! Justin! What are you doing with those fools? You can’t seriously have joined… Those guys? For real? Joined Dark Core?! He’s one of us now! Mr Sands is his grandfather and he has joined the true side. Our side! It is true, Lisa. I’ve made an alliance with my grandfather and I know and trust I’m doing the right thing. I can feel it in my heart. Ahhh! Run away! Run! Lisa’s gone insane! Arghh! Get away from here! Run! Hahaha! That made them run. Ha! It was the funniest thing I’ve seen in a long time. They got away, but they all learned a lesson. This time I only intended to scare them. I think the danger has passed. For this time. Approach Lisa to complete the quest. Hi Rita! It’s so good to see a friendly face again! Whooo! Starshine told me that you and Summerblaze were on the way here, you’re a real hero! You made the Sleeping Widow save me, and Starshine was able to help me out of the crack and away from that horrid Pandoria. No words can describe how grateful we are that you saved me from that place! It was quite the ordeal, I’ll tell you. But enough about me. Are you okay? You’re not hurt? Oh! I see it, your poor Summerblaze is seriously injured! That was a nasty trap. I can heal your friend if you like. As you might know, the Circle of the Star is the power I’m most able to master, and that the Star symbolizes the power of healing? 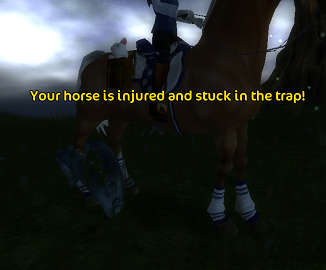 Let me heal the poor horse. Objectives: Let Lisa try to heal your horse’s injuries. Watch as Lisa heals your horse. Look at that! That went better than expected. Your beautiful Summerblaze is right as rain. That was a mean trap. Nothing to toy around with. Those Dark Riders shouldn’t be keeping such dangerous items in their arsenal. I’m really grateful you saved me. I mean it. It wasn’t a pleasant experience being imprisoned in Pandoria, I can tell you that much (shiver). Those idiots I just scared off succeeded in ambushing Starshine and I when we were off guard. This time the story had a happy ending, but this cannot happen again! We really need to be on our watch now, right Rita? Recount the past events to Lisa. Alright. I understand things have been happening on the island? I haven’t paid much attention to any ongoing events myself, since I’ve more or less been stuck in Pandoria ever since I last stepped into Jorvik Stables. Of course, I could tell you lots of fun stories from my time as a touring rock star, but that’s hardly important right now. We can do that later. And between you and I, Rita, it’s not that cool and glamorous to be a rock star. I’ll have you know, it’s a lot of hard work and stressful tour schedules to keep. And fame isn’t everything. It’s nice to be back here where my face isn’t that well recognized. At least not any more. The fans forget you quickly, haha! But my friends last forever. I hope you and I will become good friends. You’re right, Rita. We must see the others and meet the druids. I was thinking the same. At least I’ll get an update on the state of things. But before all that I’ll need a change of clothes and a good rest. And something to eat. Let’s wait with the druids until tomorrow. Rest and recovery goes above all else at this time. I also owe a favor to the Sleeping Widow. But that’ll have to come later. After these escapades, we really need rest. Tomorrow you can ride to Elizabeth and tell her I’m back, so she can summon the druids to a meeting. I’ll see you later at the meeting. And listen, once again, a big thank you! You’ll be transported back to your home stable. Ride or transport to Valedale and speak to Elizabeth by her house. Lisa’s been rescued?! Great news. I wasn’t sure you’d succeed, but Aideen’s light shine strong in you, and you handle great challenges well. You are a true hero. I’ll summon the druids for a meeting in the Secret Stone Circle immediately. See you there! Objectives: Partake in the meeting in the Secret Stone Circle. Talk to Elizabeth later. Ride up behind Elizabeth’s house to the spiral path and follow the path around to the center and into the portal to the Secret Stone Ring. Hi again! And a big thank you to you, Rita. Together with Starshine, you managed to save Lisa! Finally Lisa’s back. It’s good to be back and see you all! I’ve really missed you! At one point I thought I’d never see daylight again. But now I’m here again, with all my friends. The Soul Riders are almost at full strength, and soon we’ll have gathered all four partial copies of the Light Ceremony book. When we’re ready and the time has come, we’ll perform the Light Ceremony and be protected. For now though, the time isn’t right. Lisa, you should know that Dark Core has their hands on the original Light Ceremony Book. Everything points to that they’ll attempt to conduct the ceremony backwards, which will catastrophic consequences. That doesn’t sound good at all! What will they gain by this? What is their goal? If they perform the ceremony backwards, the crack between our reality and Pandoria will widen. In the worst case, that which keeps our worlds separated will tear apart. What exactly happens next, we don’t really know. One guess is that both our worlds will cease to exist. Or at least cease existing in the form and shape we know today. It will probably lead to the end of the world, so it needs to be stopped at all costs. That was a brief summary of the current situation. Lisa, could you tell us what happened to you? You were kidnapped and taken to Pandoria? As you all know, I was on a world tour with my rock band and I’d been away from Jorvik for a while. When I finally ended my tour and came back to Jorvik, those ill-witted Dark Riders succeeded in ambushing Starshine and me. Then they imprisoned me in the horrific world of Pandoria. Starshine and I weren’t on our guard. That’s a mistake we’ll never repeat. Later I was rescued, as you all know. Thank goodness. In Pandoria I got in touch with the Primeval Tree, the Sleeping Widow. 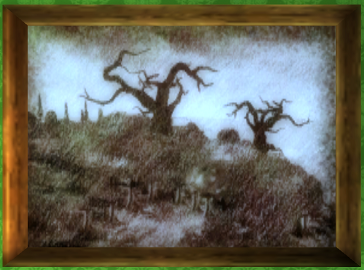 It was blurred and unclear, but her roots seemed to penetrate even into the unknown world of Pandoria. 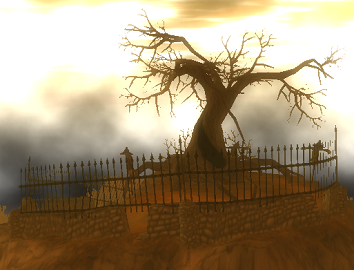 The Primeval Tree slept in our world, but in the dreamscape of Pandoria she could reach out to me and communicate. She said she could help me out of Pandoria, but the only way to do so was to wake her up. As a gesture in return, I was to help her with something. I don’t know what yet, but I plan to find out. My time in Pandoria is incoherent and blurred, but one other thing happened. I got a strong feeling Anne was there at the same time as me. It wasn’t just a weak sensation. I could really feel her presence and it was clear. Because of this, I’m convinced Anne is there, and we have to try to save her. Interesting news. Maybe Anne is in Pandoria. It would be great if we could locate her and save her as well. I would go so far as to say it’s completely necessary. In a worst case scenario, it would require a rescue operation in Pandoria, but that’d have to be our last resort. At full strength, we would be very powerful! We’d also need to be aware of the dangers of a trip to Pandoria. One does not simply walk into Pandoria. I am not afraid! We have to save her no matter what the risk. We owe it to her. If we have the slightest lead, we have to follow it up. We’re always there for each other one hundred percent! Hmm… Another matter. I wonder if we can lure Justin away from the grip of the Dark Riders? He an I went to the same school, I know him a little. And Rita, you know him a bit too, right? If we can remove Justin from Dark Core and the Dark Riders, they’ll weaken even more. It’s true. At least Rita stopped Justin from turning his horse into a Dark Horse. That’s good. Last time Rita visited the headquarters of Dark Core and saw Justin, he seemed quite determined to continue to work for the dark side. If you could remove Justin from Dark Core, it would be a massive achievement. But for now we’ll focus on the Light Ceremony we’ll be performing when the time is right. We’ll also keep an eye on any movements the Dark Core makes. We also need to find the other copies of the book, and try to rescue Anne. This meeting is adjourned for now. We’ll see each other again soon. Welcome back to reality, Lisa. And yet again, many thanks to you Rita, for your efforts for the Keepers of Aideen. May the light of Aideen shine upon us, and scatter the darkness that surrounds us. And listen, Lisa. Don’t forget to return the favor. The Primeval Trees have a tendency of primeval rage if they feel tricked, and the wrath of the Primeval Tree is the last thing we need just now. When you return to reality, ride back down to Elizabeth and speak to her. Look at that. Another druid meeting conducted. Did we get wiser? Lisa’s been rescued thanks to you, and we have a lead on Anne… But other than that, we’re still going over the same ground. We need to collect the other two book copies so we can prepare ourselves to perform the ceremony when the time comes. Later we need to follow up on the information about Anne. But are we really ready to conduct a rescue operation in Pandoria? Isn’t that doomed to fail? Maybe there’s another way… Maybe the Sleeping Widow can help us again, but before that we probably have to return her favor. Listen to Elizabeth’s final advice. We’ll have to keep our eyes and ears on the Dark Riders and their antics. It’s obviously important to them to destroy us, and they nearly took you to Pandoria. We need to take counter-action. Return to Lisa, at Jorvik Stables, tomorrow.